In 2016 The City of Welland joined other progressive cities across the world to create a smarter city that makes life easier for residents and stakeholders. Since then, we have adopted advancements in digital technology to assist in delivering services that connect and engage with residents. Being a Smart City is an urban development vision that is transforming how communities operate and manage population growth amid increasing urbanization. While there isn’t a universally agreed upon definition, indicators are used to gauge a Smart City and grow smarter initiatives. Check out any of the five indicators below to discover Welland’s Smart City initiatives. Broadband – Broadband infrastructure is now less of a luxury item and becoming more of a necessity. High fibre optics connects people to business, and business to productivity. Smart Cities are growing broadband to better link residential and commercial communities. Knowledge Workforce – Cities and industries are becoming more innovative and warrant a workforce that is qualified and willing to continue learning. Welland is proud to sponsor Niagara College on projects and build partnerships that enrich youth retention. Innovation - Smart Cities find ways to bring smarter services to people with fewer demands on resources. Welland is always seeking new strategies to improve projects and services through public/private partnerships, or by finding solutions with a holistic inter-departmental approach to problem solving. Digital Equality – Smart Cities strive to link people to digital connectivity regardless of geography, knowledge, or income. Welland believes that digital equality will move this city forward with accessible learning through better fibre optics and the IoT. Sustainability – Improving living standards while maintaining the ability of future generations to do the same, is at the core of sustainability. 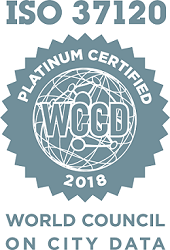 Achieving Platinum Certification from the World Council on City Data (WCCD) supports and prioritizes the city’s mandate to develop Welland’s smart city strategies. With a broad inventory of open data and association with the WCCD, the city is now able to compare best practices on a national and international level with other award winning ISO 37120 cities. The city’s Platinum Certification will assist in improving the delivery of services and information, and allow the city to participate in a worldwide organization that uses standardized metrics to find innovative solutions to shared challenges.